Marigold (also known as Calendula officinalis) is no-doubt more than a beautiful flower, with a line of researches and studies having proved so. Research has proven that this common flower, apart from wiping out garden insects, showed promising results in eradicating stubborn warts. Marigold has been in use for several years in the UK to treat several foot problems, including bunions, plantar faciitis, fungal infections, tendonitis, and verrucade, also known as plantar warts. Vlahovic, a Phytotherapist (who uses plants for medicinal purposes), investigated the use of marigold in three HIV positive patients, as an alternative treatment for the small skin lesions called verrucae. It was noticed that the treatments either greatly reduced the number and size of warts or in few cases even cleared them completely in four to six sessions, while other treatments failed to do so. The effectiveness of the plant on foot issues has been proven more than 30 years ago, and thereafter, several different mixtures of the marigold plant have been found effective in treating foot problems. 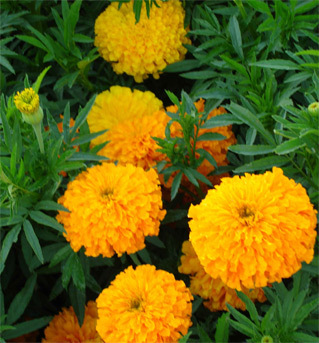 Marigold has also been proven as a natural medicine for several health conditions. The latest among these is the place that it has found in books of cancer, as a cancer-cure, given its antiseptic, anti-inflammatory and anti-bacterial properties. ‘Lutein’, the yellow carotenoid pigment found in abundance in Marigold, has a range of health benefits. Researchers at the University of Utah Medical School, Salt Lake City, India, observed 4,403 subjects during their study on colon cancer. Researchers particularly observed the effectiveness of carotenoids and their effectiveness on various stages of colon cancer. On evaluating the dietary carotenoids a-carotene, b-carotene, lycopene and lutein, zyxanthin and b-cryptoxanthin, lutein was found to be the most effective against colon cancer, particularly among youngsters. Lutein, found in HDL or good cholesterol, prevents LDL cholesterol from oxidizing. Evidence from 1994 study reveals that consuming foods high in Lutein content is associated with low risk of heart disease. A six months study conducted on 16 patients with retinitis pigmentosa (RP), who were administered 40mg/day of Lutein for four months, followed by 20mg for two months, revealed that within three to four weeks of doing the study, participants reported improvement in vision. According to researchers, food and dietary supplements containing Lutein, helps in maintaining good vision health for a lifetime. A cold infusion conducted by cooling marigold tea in a refrigerator, dipping cotton pad into the resulting solution and placing it on the eye, and replacing the pad often when required, is good for eyes. Marigold tincture is also excellent in healing burns, impetigo, and stings. It is wonderful in treatment of corns, warts and calluses, while the flowers are used in treatment of several skin conditions ranging from eczema to varicose ulcers. Marigold tea: Dried flowers of the plant can be used to make tea. The best way to use marigold is in the form of tea, by drying only the flowers and using them to make tea. For making tea, boil water and add a tablespoon of flowers to the pot of tea and let it steep. The tea purifies blood, and therefore should be had regularly. Marigold tea is a good remedy for cases of diarrhea, liver problems, herpes and glandular swelling, hepatitis, in expelling worms, and intestinal inflammation. Marigold tea and horsetail could be used in equal proportions for cracked feet, ulcerated legs, cancer and tumor growths, and non-healing wounds. Marigold juice: Both flowers and stems can be used to juice marigold. Carrot or apple juice could be added to this strong juice to ease flavour, if required. Fresh marigold juice is best used for scabies and warts. Marigold ointment: To make an ointment, chop some fresh flowers, and add it to coconut oil. Heat lightly and allow it to cool. The ointments are excellent remedy for Athletes feet, varicose veins, nose scabs, eczema, and skin infections. With such endless list of benefits, and remedies to numerous ailments, marigold can even be used daily. Several local herbalists, store dried marigolds and are easily accessible, but, one should ensure that it is purchased from a reputable supplier.